Take a cruise holiday and sail from Sydney to Vancouver aboard the Volendam (pictured above). 25 nights of relaxation sure sounds like fun to me. And by booking now you can save up to 30% off some fares. Check out the package here at http://cruisesaustralia.net.au. 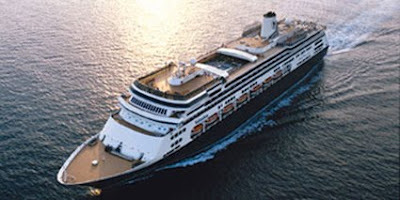 The Volendam cruise departs Sydney, Australia on April 17 2010 and arrives in Vancouver, Canada, making stops along the way at New Caledonia, Vanuatu, Fiji, Western Samoa and Hawaii, where you will visit Kauai, Honolulu, Lahaina, and Hilo. From Hawaii enjoy five days at sea before arriving in Vancouver. "Before we had time to go count lifeboats, the ship rumbled. “Oh my God, we’re moving,” Travis shouted, and we raced out onto the deck. We hung over the railing as the Volendam glided out of port, a perfectly protected bay surrounded by dusty peaks. Thick green-flecked water flowed below us and a cloudless cellophane-blue sky stretched above, the stark contrasts inviting and soothing. The air was fresh, not salty, with a hint of bracing pine. A single tiny sailboat passed us, working its way home, and we were at sea…and we were in heaven, any initial concerns melting away."